A View From The Hook: Canada Can Do It .... Why Can't We? Now, I labor that last point because the New York City Economic Development Corporation (EDC), in the process of making arguments for why they were rejecting a compromise plan for Pier 11 and the Atlantic Basin on the Red Hook waterfront - a plan that would have allowed for the inclusion of not only Phoenix Beverages, but the expanded operations of the New York Water Taxi, PortSide New York, more waterfront public access, open space and a marina (this was a plan proposed by Tom Fox, NY Water Taxi's owner) - anyway, the EDC's arguments against that plan included the point that a marina was incompatible with the operation of the nearby cruise terminal. The entrance to the Atlantic Basin, where the proposed marina would be, was right next to the Cruise Terminal, and this, we were told, was not something that was desirable. This was, by the way, despite the fact that previous EDC plans had included a marina at this location, with two adjacent cruise terminals proposed - one at the currently used Pier 12 and the other at pier 10. So it was interesting to me, on seeing the Port of Quebec, (and please do check out their web site and photos, here) how these supposedly "incompatible" elements fitted together, all nestled against the historic and beautiful waterfront neighborhoods of that city. The 415-slip marina on the St. Lawrence River (web site here) was serviced by a narrow entrance that lead to an enclosed harbor. The entrance to the marina was right next to the cruise terminal that can accommodate two or more ships at a time and services 100,000 visitors a year while also functioning as a convention center. Next to the cruise terminal was a terminal for cargo shipping and there were many other industrial shipping terminals placed around the busy waterfront which apparently services 1,500 ships a year. It all seemed to be planned to work together, without compromising security, on-water safety or the economic viability of the waterfront. The whole setting reminded me of Brooklyn and the area around the Red Hook waterfront. 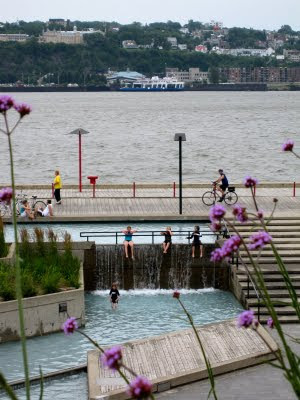 So .... why was the co-existence of all these activities, including the marina, possible in Quebec, but not in Brooklyn? The EDC will have to answer that one. One other thing the EDC could also answer is - why did you create such an ugly, inaccessible, un-people friendly cruise terminal in our neighborhood, when there were examples all around the world of how to do it right? (see my previous post on the cruise terminal in Sydney, Australia here). Cruise ship in Quebec photo courtesy of colros, via Flickr. As I walked around the Quebec cruise terminal and waterfront, watching my kids run in the parks and splash about in the fountains, and as we sat at a cafe or at a bench watching the waterfront and water-borne activity, I couldn't help but to wonder ... what were the EDC thinking?? Wow! That last photo with the pool really shows vision. It is not only a shame that the EDC will not listen to anyone but the existing lobby groups, it's thoroughly depressing to see photos like this and know what realistically could be developed. I remember the first time I read about Tom Fox's plan and I was like- Eureka! That's it-what an excellent path for the Red Hook waterfront. But hell- I guess we're stuck with chainlink and razor wire. Charleston, Portland, Providence, Boston, Rotterdam, Dublin, Sydney, Toronto and Vancouver. There are so many cases of excellent waterfront planning.